Magica® Rust Remover Gel removes rust from just about any surface including fabric, carpet, upholstery, fiberglass and much more. Simply apply it to the rust stain and watch it disappear. Shake the bottle, squeeze a few drops directly on the rust or apply it with a cloth. No rubbing or scrubbing is needed. Rinse with water when you’re done. 8 oz. gel bottle. I just ordered the rust removing gel because of a rust stain on my carpet. The carpet had been professionally cleaned but the cleaning had absolutely no effect on the stain. I applied your product and the stain disappeared literally "before my eyes". In addition to you wonderful products, I want to compliment you on your outstanding customer service. Your explanation on how to use the product was excellent. It is a fantastic product and I will pass on the info to anyone who I know of who has a problem. I am absolutely amazed at this product (Magica Rust Remover Gel). I was skeptical to buy it because there are so many products out there that promise to do the job and are a waste of money, but it was worth every penny. I had a sleeper sofa in my finished lower level for 6 1/2 years, and when I went to move it there were rust spots from the springs on the light beige carpet. It was hard to believe how this product worked. I am so thankful since I couldn't afford to replace the carpet before I moved. 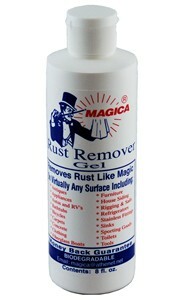 Magica Rust Remover Gel will take rust out of carpet right in front of your eyes. It is super. A. Yes, it works on laundry. We recommend it as a spot treatment only.